Official artwork of Tom Nook from Animal Crossing: City Folk. 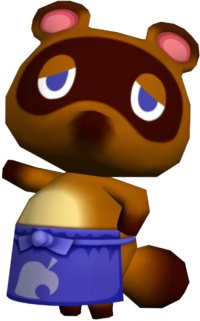 Tom Nook (たぬきち, Tanukichi) is a major character and shopkeeper in the Animal Crossing series. Tom Nook is the central shopkeeper in the earlier Animal Crossing games, and is also the one who sells the player their house, and they must work for him to pay off the loan. In Animal Crossing: New Leaf this role is expanded on, and he now runs the real estate agency Nook's Homes, while his nephews Timmy & Tommy run his old store. The fact that he sells the player their house is likely what inspired his role in Villager's Final Smash. Tom Nook appears as a trophy. As his presence in Melee predates the international release of Animal Crossing, his source game is listed as "Future Release" when the game is not set to Japanese. Tom Nook's trophy is obtained by collecting 1000 coins. This guy's the friendly neighborhood shopkeeper who kindly helps the player set up his or her first house. He has a nose for business, and his customer service is second to none. During the course of the game, his store starts as a corner shop, expands to become a convenience store, and finally becomes a thriving supermarket. Tom Nook appears as a trophy and a sticker. He also appears occasionally as a background character on Smashville, watching the fight. Once again, Tom Nook's trophy is unlocked by collecting 1000 coins in Coin Battles. Tom Nook and his nephews appearing in Super Smash Bros. for Wii U as part of Dream Home. Tom Nook reappears as a trophy in both versions, and as a background character on Smashville. He also appears in an identical background role on Town and City. More notably, Tom Nook, along with his nephews Timmy & Tommy, appears in Villager's Final Smash, Dream Home. In that context, he is paid by the Villager to build a house around one or more opponents, which explodes upon completion. In this appearance, he wears his blue apron. Tom Nook's trophy is different between the two versions of SSB4, both in his clothing and the name of his store in the description. His 3DS trophy references Nook's appearance in Animal Crossing: New Leaf, while his Wii U trophy similarly references Animal Crossing: City Folk, specifically his Nookington's suit. : Currently the owner of Nook's Homes, yes, yes. "Yes, yes" is his favorite catchphrase. Despite all the money he's earned, he'll never lose that down-to-earth charm. With such a friendly demeanor, there's just no way he could be trying to rip you off. So trustworthy, yes, yes! : The owner of Nook's Homes, yes, yes. ..."Yes, yes" is sort of a reassuring catchphrase of his that totally removes any lingering feeling that he might be trying to swindle you out of your hard-earned cash. What an upstanding businessman, yes, yes! Tom Nook's trophy in for Wii U is part of the The Beginning of Animal Crossing 1 Trophy Box. : The owner of Nookington's, yes, yes. "Yes, yes" is his favorite catchphrase. Despite all the money he's earned, he'll never lose that down-to-earth charm. With such a friendly demeanor, there's just no way he could be trying to rip you off. So trustworthy, yes, yes! : The owner of Nookington's, yes, yes. ..."Yes, yes" is sort of a reassuring catchphrase of his that totally removes any lingering feeling that he might be trying to swindle you out of your hard-earned cash. What an upstanding businessman, yes, yes! Tom Nook reappears in Super Smash Bros. Ultimate as a background character in Smashville and Town and City. He reappears in Villager's Final Smash and now appears in Isabelle's Final Smash along with Timmy & Tommy. This page was last edited on March 26, 2019, at 23:06.